Patchwork in a Nutshell. Tutorial ~ DIY Tutorial Ideas! When piecing fabrics it is essential to press each seam as it is stitched. Firstly, before opening the pieces and therefore on the wrong side, press the seam flat, to set the stitches. Then, on the right side of the fabric, press both seams towards the darker fabric, using the toe of the iron and finally on the wrong side. It is also acceptable to press seams open as this helps to distribute the bulk of fabric created when lots of seams meet for example in the centre of a star block. Press rather than iron preferably without steam. Spray starch can be used to help return a washed fabric to its original condition. These need to be accurately made from either rigid plastic or cardboard.The templates given in our Pattern Section are usually full sized. Seam allowances of 1/4" are used unless otherwise stated. For hand piecing make templates without adding the seam allowance, but for machine piecing include the seam allowance. Label each template with the name of the design and the grainline. Rev. on the template or in the instructions, means the pieces are cut out with the template reversed (turned over). Squares, rectangles and other shapes can be quickly cut from strips of fabric using a rotary cutter, self-healing cutting mat and see-through acrylic ruler. A rotary cutter has a very sharp blade which must be shielded at all times when not in use. Always cut away from the body and dispose of used blades in a responsible manner. Store the cutter out of the reach of children. To straighten the edge of the fabric prior to cutting strips, fold in half with selvedges together and place on cutting mat. Place the ruler on the fabric, at right angles to the fold and cut the fabric to give a straight edge. Place the cut edge of the fabric to the left of the cutting board, if right handed, (to the right, if left handed,) then using the ruler, measure the width of strip to be cut. Hold the ruler in place and cut along the edge. Always add on the appropriate seam allowance to finished dimensions. Several layers of fabric can be cut at one time. Place a template, without an added seam allowance, on to the reverse of the fabric following the grainline and draw around it. This is the stitching line. Cut out adding a 1/4" seam allowance. Following the design, place two patches, right sides together and pin at right angles to the seam. Sew the seam through the pencilled lines using a short running stitch. Begin and end each seam at the seam line (not at the edge of the fabric) with 2 or 3 backstitches, dia. 1a. Patches are cut with a seam allowance already added. It is necessary to stitch with an accurate 1/4" seam. This can be achieved by adjusting the needle position to give 1/4" with the normal sewing foot, using a special 1/4" foot or by sticking a strip of masking tape to the throat plate, 1/4" away from the needle. 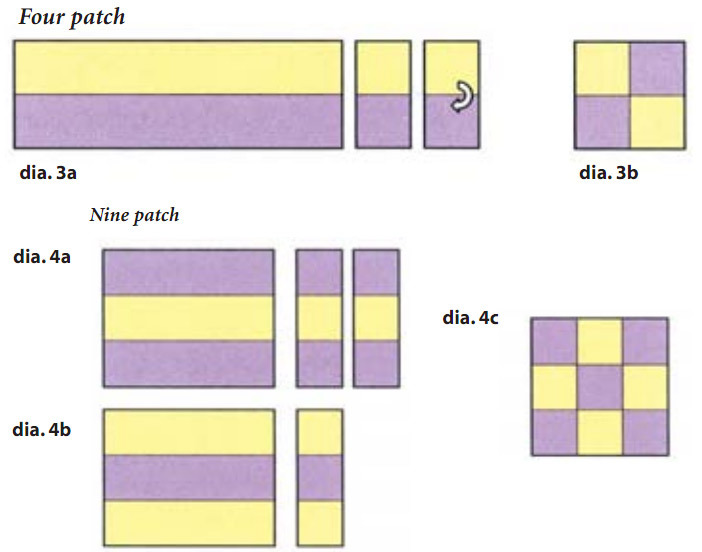 Align patches and pin together at right angles Stitch all the way from edge to edge, dia. 1b. Pairs of fabric pieces are sewn together, one after the other, without lifting the presser foot on the machine or cutting the threads. They are cut apart later. This saves time and thread, dia. 2. When following these instructions always join pieces using a 1/4" seam allowance. To piece a four patch block with alternating squares, cut two strips of contrasting fabrics the required width plus 1/2" for seam allowances. Place right sides together with long raw edges matching. Stitch and press towards darker fabric. Cut the sewn strip into sections the same width as the original strips dia. 3a. Take two of these cut units, reverse the colours so that the central seams lock together, dia. 3b. Stitch following instructions in Chain Piecing. - Set consists of two sets of dark, light and dark strips dia 4a. - Set consists of one set of light, dark and light strips dia 4b. After stitching the strips togetherand pressing the seams towards the dark fabric, cut apart as described for the four patch. Reassemble as shown in dia. 4c. Cut two squares of different fabrics 7/8" larger than the required finished size of the unit. Place right sides togetherand draw the diagonal line. Stitch each side of this line dia. 5a. Cut along the drawn line, open out each pieced square and press seam allowance towards the darker of the two fabrics, dia. 5b. Cut two squares of different fabrics 1 1/4" larger than the required finished size of the unit. Place right sides together and draw on both diagonal lines. Stitch either side of one of these diagonal lines, then cut along both diagonal lines dia. 6a. Press towards the darker fabric. 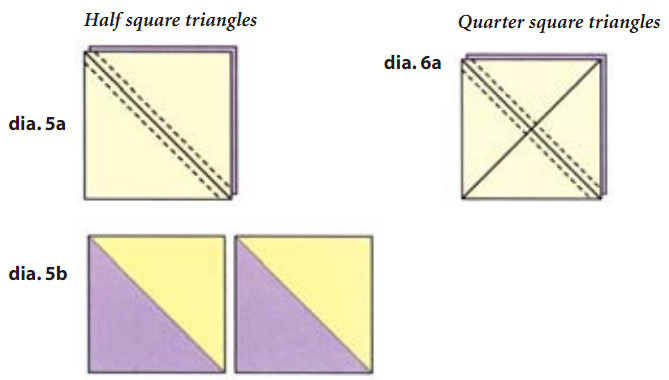 Join these triangles together in pairs to form two pieced squares, dia. 6b. These instructions will produce a strip of ‘Flying Geese’ 8" x 4", dia. 7a. Cut one 5 1/4" square of ‘goose’ fabric. Cut four 2 7/8" squares of ‘sky’ fabric. Draw one diagonal line on the wrong side of each of the ‘sky’ squares. Place ‘goose’ fabric right side up. Pin one small square, right side down, into the corner and likewise in the opposite corner, dia. 7b. Trim off corners where they meet in the centre. Stitch either side of drawn diagonal line from corner to corner. Cut along the pencil line. Take one of the halves and place another small square into the remaining corner, pin, carefully matching the edges, dia. 7c. Finger press the two sewn triangles out of the way. Stitch, as before, either side of the line. Cut on pencil line and repeat with other half. A traditional patchwork method where the fabric is folded and stitched over an accurately cut stiff paper shape. The fabric is cut out with an added seam allowance and tacked over the paper. The fabric covered shapes are then placed right sides together and overstitched with small neat stitches. On completion remove all of the tacking stitches and papers. Hexagons and diamonds are often stitched in this way. 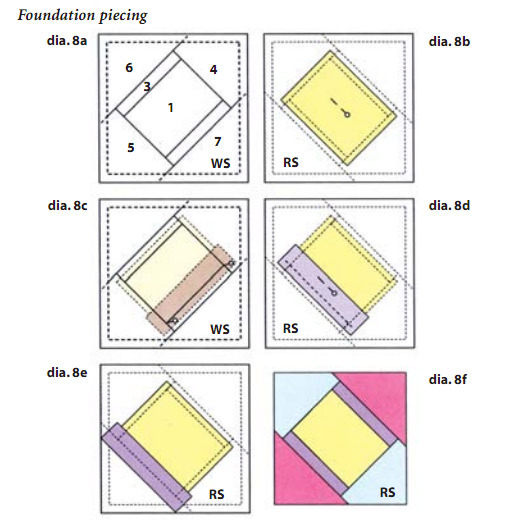 A very accurate piecing technique where fabric patches are stitched to the reverse of a foundation block. Depending on the material used for the foundation it can be either left permanently in place (e.g. lightweight cotton fabric or sew-in interfacing) or can be removed (e.g. paper or stitch ‘n tear). First the block design must be traced or photocopied accurately on to the foundation fabric and the order of stitching each patch noted, dia. 8a. The design should appear in reverse to that of the finished block. Patches are stitched to the blank side of the foundation. It is useful to have a light source (e.g.window or lightbox) to help position patches. Seam allowances are trimmed down as the block is stitched so accurate cutting of the pieces is not necessary. If machine stitching use a slightly smaller stitch than usual especially if the foundation is to be removed. Begin with the patch for area 1. Cut a piece of fabric slightly larger than the area to be covered and position this right side up, onto the blank side of the foundation, over area 1. Pin in place, dia. 8b. Now cut a piece of fabric that generously covers area 2. Place this right side down over patch 1, aligning the corresponding seam lines. 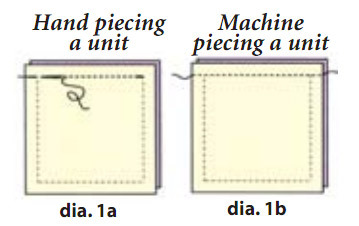 To help with placement of fabric mark each end of the stitching line with a pin, dia. 8c. Pin patch 2. Turn the foundation over and stitch along the line between patch 1 and 2 starting and finishing a few stitches beyond the marked line. 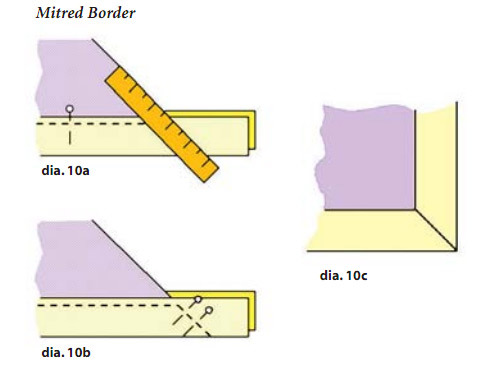 Turn block over and trim seam allowances, dia. 8d. Flip patch 2 so that the right side of the fabric is now visible and press flat, dia. 8e. Continue to stitch patches in numerical order, making sure that the fabric extends over the seam allowance around the outer edge of the block. When the block is complete, trim it to the 1/4" seam allowance, dia. 8f. The technique of attaching one or more fabrics to a background with hand or machine stitching. For all methods lightly mark the front of the background fabric to show where to position the pieces. Always use a thread to match the colour of the shape to be appliqued. Needle turned applique. Cut out shape adding a 1/3"- 1/4" seam allowance. Pin shape in place and slip stitch down, turning under seam allowance with the needle as you go. Cut freezer paper to exact size of design and press shiny side of paper to wrong side of fabric. Cut out adding 1/8"- 1/4" seam allowance. Press this over the freezer paper to give a sharp edge. Pin in place on the background fabric and slip stitch almost all of the way round the shape, leaving a small gap. Remove the paper and complete stitching. Apply fusible web to back of fabric before cutting out each drawn shape accurately, without a seam allowance. Press into position and use a zigzag, satin stitch or buttonhole stitch to attach. This is the ‘opposite’ of applique, where a layer or layers of fabric is removed to reveal the design. By hand - cut 2 pieces of fabric and draw the design on the right side of the top fabric. Pin the other fabric beneath the top fabric, right side up, dia. 9a. Tack layers together about 3/8"- 1/2" outside the marked design, dia 9b. Use a small, sharp pair of scissors to cut 1/4" within marked line. Clip curves and corners to the marked design. Use a thread to match the top layer. 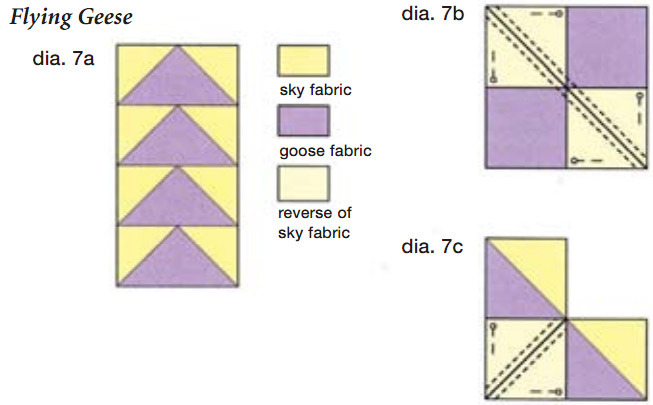 Use the point of the needle to turn under the top fabric to the marked line of the design, dia. 9c. Slip stitch to the second layer. Turn work over and trim away excess fabric, dia. 9d. By machine - mark the design on the wrong side of the second layer of fabric. Sandwich fabrics as for hand reverse applique. Use a straight stitch and working from the back of the fabric, stitch, exactly following the line of the design. From the right side of the fabric sandwich, use a sharp pair of scissors to cut as close as possible to the inside of the stitched line thus removing the top layer of the fabric revealing the design. This cut edge can then be covered with a row of satin stitch. This frames the finished quilt top. A border can have butted or square corners, i.e. where one strip is joined to another to form a 90 corner. To measure fabric for a border, measure the width of the quilt top through the centre. Cut top and bottom borders to this measurement. Now measure the length of the quilt, again through the centre adding twice the width of the border plus 1/2" seam allowance. Alternately, use a mitred border, where 2 strips, with 45 ends, are joined to form a 90 corner. Cut border strips the length of each side of the quilt, plus the border width, plus 1". When joining, begin and end stitches 1.4" from the corner edges. Referring to dia. 10a, fold the quilt top right sides together, diagonally at one corner. Fold the border and the quilt seam allowances toward the quilt top and pin through both layers. Place a ruler along the folded edge of the quilt top, through the last stitch in the border seam and across the border, draw a line. Align the long raw edges of the borders and pin together along drawn line. Stitch along the line from inner 1.4" to edge of border, dia 10b. Trim seam allowances to 1.4". Press open. If multiple borders are to be used, then stitch them together first and treat as one piece. 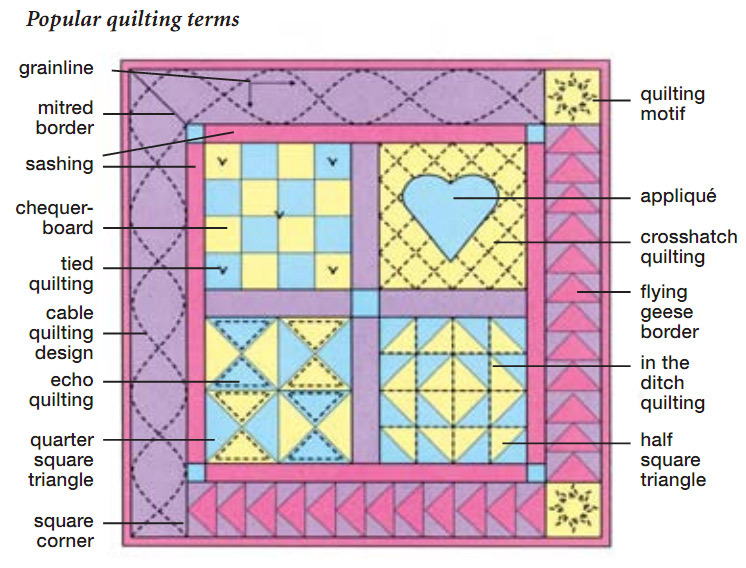 The quilting design may be marked before or after the quilt is sandwiched, depending on the method used. If the design is on paper, it has to be traced through the quilt top, before sandwiching, with the help of a light box or a window. Designs can be traced from homemade cardboard templates or from commercial plastic stencils. Masking tape is useful for marking straight lines and is generally applied after the quilt has been sandwiched. Do not leave it stuck onto the fabric for any length of time. Intricate designs can be linked with simple straight and curved lines. Try not to have some areas heavily quilted and others with little or no quilting.Make sure that whatever method chosen to mark the design can be easily erased. Always test on a scrap of fabric used for the quilt. Do not iron over any marked areas as the marker may set in the fabric. This is the filling for the quilt and it is available in a variety of fibres from 100% polyester to 100% cotton plus mixtures and wool wadding. The type chosen will depend on whether the item is to be hand or machine quilted, whether high or low loft is required and whether the item is to be draped over a bed or hung on a wall. ‘Loft’ refers to the weight and thickness of the wadding. Always allow at least 2" extra wadding all the way round the quilt as it will shrink as it is quilted. Open out the wadding for the creases to fall out and to allow it to breathe before using it. The piece of fabric that will be on the reverse of the quilt should be of similar weight to the quilt top. It could be pieced; this is then called back art. It should be cut at least 3" larger than the quilt top to allow for shrinkage on quilting. Give the quilt top and the backing a final press if they haven’t been marked with a quilting pen. Polyester wadding should not be pressed as it becomes flattened. Lay the backing fabric right side down on a flat surface and secure with masking tape. Lay the wadding on top, smoothing out any creases as you go. Place the quilt top, face upwards, on top of the wadding, matching centres of each layer on all sides. For hand quilting, tack or baste the layers together using a tacking stitch which is longer than a normal running stitch, about ?". Start in the centre with a long length of thread and stitch to one edge; finish off with a back stitch. Return to the centre, re-thread needle and stitch to the other side. Tack a grid, about 4" apart across the quilt. It is advisable to use sharp, curved safety pins to hold the layers together if the quilt is to be machine quilted as tacking threads get caught up and are difficult to remove after machine quilting. Pin every 4" and remove as the quilting progresses. A special basting gun with quilt tacks can be used in a similar way. There are also basting sprays available that can be used to hold the layers together. Follow the directions on the can carefully as they all differ. Always use in a well ventilated room. There are many wonderful threads available for both hand and machine quilting and it is quite acceptable to combine both techniques and a variety of threads in a single project. The size of the stitch is not important when hand quilting but the aim is to have stitches of the same size on both the back and the front of the quilt. Use a betweens needle which is short and sharp. They come in a variety of sizes – 8/9 are slightly longer than 10/12. Experiment to find which is most comfortable and which takes the thread, especially if using a slightly thicker thread than usual. Cut a length of thread 18" long and make a small flat knot in the end, just cut from the reel, to prevent knotting whilst stitching. A well fitting thimble for the middle finger of the sewing hand is advisable. Sit comfortably, in a good light and use a frame to support the quilt and also help keep the stitches even. To prevent creasing never leave the quilt in the frame at the end of a quilting session. Always start quilting from the centre of the quilt and work outwards. To start quilting, insert the needle into the front of the quilt, about 1/2" along the line from the starting point, bring it out on the top of the quilt at the beginning of the line. Tug slightly to bed the knot in the wadding. Make a small backstitch to secure the thread then take regular running stitches following the marked line, 3-4 at a time. Place the nonstitching hand under the quilt to feel where the needle comes out each time and guide it back through again. Finish by making a knot about 1/4" from the surface of the quilt, take a back stitch and pull the knot into the wadding. This can be a quicker method for quilting a top but it does take practice. Feed dogs raised. It is advisable to use a walking foot or the built-in, even-feed feature on some sewing machines. This allows the layers of fabric to pass through the machine without puckering or shifting. For repeating straight lines across the quilt top use a quilting bar, one is usually found in the machine tool box and is ‘L’ shaped. It fixes into the back of the walking foot and the spacing can be adjusted from 1/2" to about 4". When stitching a more intricate design, it is worth spending time considering how to stitch as long a continuous line as possible, to prevent constantly starting and stopping. Feed dogs lowered Using a darning foot, reduce the stitch length to 0 and remember to lower the foot, thus engaging the top tension. The speed at which the quilt is moved will determine the stitch length. With practice, the benefit of this technique will quickly be discovered as the quilt can be moved forwards, backwards and sideways without having to be turned. It is advisable to start quilting in the centre of the quilt and work outwards. Start by putting the needle down into the quilt and bring up the bottom thread to prevent knotting on the back. There are various ways of dealing with the threads at the start and end of a row. Some machines have a locking stitch that can be used or the ends can be left to be knotted and sewn in at the end. 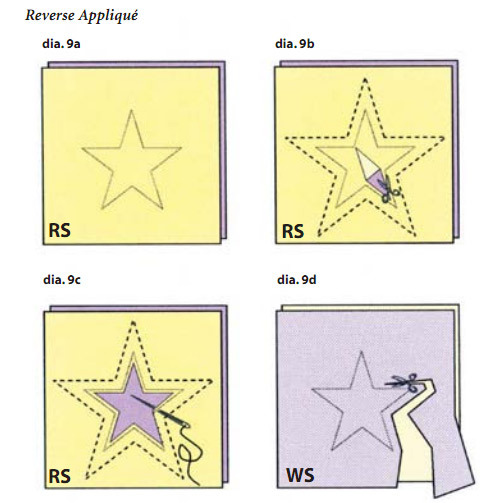 Another option is to choose a satin stitch and reduce the stitch length and the stitch width to almost the smallest stitch on the dial and holding on to both upper and lower threads, take 4-6 stitches to secure the thread. Continue stitching by setting the stitch length to the required size and stitch to within 1/4" of the end and repeat the process. Trim threads at the start and finish. Thread a needle with a long, unknotted length of perle type cotton. Mark the quilt with pins to show the position of each knot, about every 4". Take a backstitch over the pin and through all the layers, leaving a 3" length of thread. Make another backstitch over the first one, cut thread leaving the same length at the end of the stitch as at the beginning. Tie the tails of thread into a square knot (right over left, then left over right). Trim ends neatly to the required length. Repeat over the rest of the quilt. Trim edges of the quilt so that all of the layers are even and the corners are square. For a double binding cut 2 1/2" wide strips of fabric, long enough to go all the way round the edge, joining where necessary, on the diagonal. Fold in half, right sides out and press. Starting in the centre of one side of the quilt and with right sides together, machine stitch the strip to the quilt 1/4" from the corner, backstitch a little and remove quilt from the machine. Fold the strip up at 45 dia. 11a and then back down to align it next to the adjacent quilt edge, dia. 11b – this gives spare fabric to fold over to the back of the quilt for neat corners. Pin and stitch. Continue in the same way around the quilt. For smaller projects, a 1 1/4" wide single binding, is appropriate. All bindings can be cut on the straight of the grain unless the edge of the quilt is curved, in which case, a bias cut binding should be used. If a quilt is to be displayed at an exhibition or hung on the wall at home, it is necessary to attach a sleeve to the back of it. Cut a length of fabric equal to the width of the quilt minus 2", by 8 1/2" wide. Turn under each short edge and stitch to neaten. Fold in half longways, wrong sides together and place the raw edge to the top of the wrong side of the quilt. Pin. This can then be machine stitched at the same time as the binding is attached. Slip stitch the centre folded edge of the sleeve to the back of the quilt. Always stitch a label to the back of a quilt – before or after quilting. It is nice to explain who pieced and quilted it, where and when it was stitched and if it was made for someone in particular or a special occasion. The label could be hand written using a water resistant pen, or it could be hand or machine stitched. Many quilters use their computers to print fabric labels. It is always good to find a quilt with information about its history and maker.